Razors Edge Pitbulls was started in MD and DC by Dave Wilson and Carlos Barksdale. They initially started out with game dogs. To be clear: this article is referring to “Razor’s Edge Pitbulls” it’s history before later playing a key role in the Evolution of the American Bully. This article details the beginning of Razors Edge, but recognizes the difference between the name “Razors Edge Pitbulls” and the American Pit Bull Terrier breed. To begin, they started researching everything that they could find and read just about every book publicized at the time. They also subscribed to many dog magazines like the ADBA Gazette, as well as some of the underground ones. Next, they called nearly every breeder that they could find and questioned them, If it said Pit, they were on it. Eventually, they saved enough money to get some real papered, game dogs from good bloodlines. They purchased some of the best around at the time, even paying $3500 way back then for a Grandson of the great “Plumbers Alligator,” mainly Mayfield lines. Dave and his friend Carlos were very heavy into the game lines and had dogs from Hemphill to Wilder blood (Old Family Reds) These were big game dogs. Later on they hooked up with George Williams in DC and purchased a dog they named Diablo, from Wildside Kennels. A little backstory for those who may not be familiar- Ed Faron authored The Complete Gamedog: A Guide To Breeding and Raising The American Pit Bull Terrier which has been passed between game breeders for years. We are against dog fighting but this book does detail the history of the APBT, and unfortunately that includes dog fighting. Ed Faron contributed to a lot of the information we have today on The American Pit Bull Terrier including breaking down the History of The Tri Colored Pit Bull. Ed was convicted of dog fighting twice with the most recent charges coming in 2008. Diablo’s dad was a bigger catch dog, “Hollinsworth Bull”. His mom was a game girl names “Wildsides Ms.Leaky”. This was the turn around time when Razors Edge Pitbulls started adding more size. The first ever registered “ADBA” Razors Edge Pitbull’s breeding was from his Mayfield boy Zeus to a Mayfield girl name Jinx. Jinx was actually given to friend back then named Curt Plater, now CLP Kennels. You’ll see “CLP” on many of your dog’s papers if you look back far enough. He owned the first ever Razors Edge Pit bulls dog. Dave and Curt would lose contact after this for many years before hooking up again. Around this same time pit bulls were banned in PG County and Dave was forced to move. Eventually though, through Dave’s job in the Pet Store industry he landed a mangers job at a Pet Store in VA. So he moved to VA and still resides there as Razors Edge Kennel. Dave managed a Pet Store, worked as a professional dog trainer, and still bred bigger ADBA game dogs. He also put fliers in the Washington Post explaining what the breed was and what Razors Edge Pitbulls was about. Dave met a guy name Ron Smith who came aboard and took Razors Edge Pitbulls to another level. Ron already knew every UKC and AKC breeder under the sun. Ron had been researching on his own for years. The man really was the “Pit Guru”. He first contacted Thingy ’n’ Bull Kennels. They turned them onto some people in Cali with the blood that they were after. Candace Eggart was one. Candy sent pictures of what she had. Just to give you a time frame, Candy sold a dog years later to Tony Moore named Showtime! Showtime went on to be one of the foundation dogs in the Greyline bloodline! So this was years before Greyline was even around. Dave and Ron went to every breeder on the East Coast. Up north to Bobby Morehouse, Beth Jones, a friend of his Lee Fitzgerald, Flying A’s, Minot’s Ledge, etc. they actually purchased a blue brindle female named “Sadey” from Minot’s Ledge. This litter was had an extraordinary pedigree. The top half were mainly Flying A’s dogs like “Oreo” and “Reo Speedwagon.” Dogs he had seen and liked. You could see in the extended pedigree how these dogs stemmed from Ruffian dogs. Then you could see how it went back even further from the AKC Ruffian dog to the UKC Colby dogs. This top half of the pedigree actually show how Pits eventually were registered as Staffs! Dave thought that was cool to see on paper and in a dog he owned. Then the bottom half of the ped went right back to Stratton dogs. Dogs like Going light Barney, dogs he grew up reading about! Thanks to Richard Stratton, Then behind them were the same Colby dogs he saw on the top half of the pedigree. So he had this dog that showed the history of the Am. Staff and the directions the Colby line went in the UKC. he also purchased a male named “Razors Edge Blue Maxx”. His top half was a dog named “StoryTime’s Upon this Rock” AKA “Peter” Peter was a dog bred by Beth Jones. He was a big dog, but kinda ugly. They bred him to “Wassuc’s Farm Maggie May”. Dave really liked this compact girl. He researched her lines and found she was Ryan. When they got to see the Ryan dogs they were surprised to see they were game dogs. They were AKC registered Staffs, but they still bred for game dogs! This was something Dave had never seen, I’m sure that’s why the AKC people didn’t like that line, . However, Dave loved it! Bully, game, blue, staffs! Now that’s what I am talking about! Maxx was there boy from this blood. Now Razors Edge Pitbulls was big ADBA game dogs, one UKC Blue Brindle girl, and a Big hot Blue Fawn AKC boy. In Va. there was Sharon Stone of Cloverhill, who had the biggest Staffs Dave had ever seen! Her old stuff was huge! Too tall for what he was looking for, but huge! They changed years later and went more showy. Razors Edge Pitbulls Paco, was in Dave’s opinion actually a throw back of her older days. Ginny York, Pam Perdue, GiGi, the Garretts, etc….they visited them all. Even went down to Florida and checked out Marsha Woods. Met KC Courtier of Watchdog Kennels. Eventually, went up to Md and met Kimmar Kennels. As soon as Dave stepped on the ranch, he knew he had found the build he was looking for! The Razors Edge Pitbulls package was almost complete. Razors Edge Pitbulls had been advertising in the Washington Post for many years. Some young guys from DC used to come down and hang out and bring their dogs. Edwin Salinas and Joey Nevils were two of them. These guys had been buying dogs from Kimmar and mixing their own stuff in them too. Kimmar used to have an ad in the post under the Pit Bull ads, it said “Petey pups”. They didn’t want their dogs to be labeled as Pits; but they advertised directly under Pits. Anyway, local people knew the deal and picked up a lot of her dogs. Joey, Edwin, Joey’s pops, and their boys had a bunch of these dogs. Even some old friends of Dave’s Jerry and Gerrold had yards with these dogs. They all had game stuff in the mix. Dave tapped into a lot of their dogs as well to create Razors Edge pitbulls. In Kimmar’s yard he learned a lot about breeding and genetics. Dave spent every weekend there for almost three years, and actually put on a training class for all her buyers every Sunday. Razors Edge Pitbulls had been breeding now for a few generations and even used a lot of dogs from other people in the mix. Ron, also had some Pitbulls who were already in the game. Kimmar actually used there dog Maxx for some breedings. Eventually they purchased around 15 dogs from her line, including Knuckles and Rage. While these pups were growing, Razors Edge already had it’s formula. They just wanted a different head. They were not given papers on some of these dogs and they had to be UKC registered instead! This is where Razors Edge Pitbulls became heavily involved in UKC. Dave started searching for a better head and came into some Watchdog stuff. KC was not breeding anymore, so he had to find that blood somewhere else. he bought dogs from Grapevine Kennels, and also hit up Hughzee’s, who he believe later on became Chaos Kennels. They had been talking to Pam from Gaff Kennels for a few years, and really liked a boy name Seiko. So they got a dog from her. So Dave began to experiment with a lot of lines and different dogs. Razors Edge started having a real consistent look. The heads were big, but they still wanted them to be a little blockier. A few generations later and it was pretty much there. 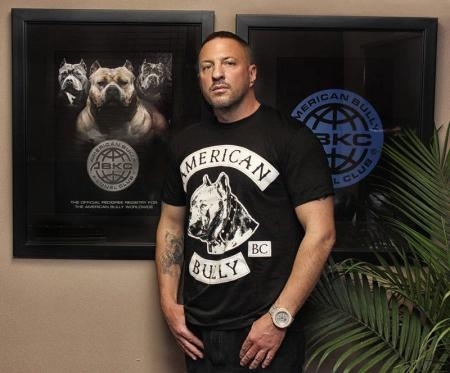 So by taking combinations of dogs and bloodlines Dave eventually got to the style of pitbull he wanted, now called “Bully Style” of Razors Edge Pitbulls. Meaning large in size, such as a large head, wide chest, short blocky muzzles, large, but not over done bone, and a shorter back, but at the same time correct as the United Kennel Club and American Kennel Club judge by. Razors Edge Pitbulls’ Dave purchased a pup from the breeding of Kimmars Catt Man Roo and Pam’s White Path China Black. These two dogs produce a few dogs in the litter that helped to promote the Razors Edge pitbulls line, dogs such as: GR CH Razors Edge Throwin Knuckles, CH Razors Edge Inna Rage, and Razors Edge Sapphire Lil. Another breeding that produced one of the most famous dogs in the history of Razors Edge was between Ch. Jackson’s GMJ Mr. Brooks and Razors Edge SilverSadey of ML which produced GR. CH. Razors Edge Sadey’s Paddington and also Kim’s Blue Dekota. Dave used Ch. CloverHill’s Watuka Spirit AKA Paco and bred him to Paddington, which produced the legendary CH. Razors Edge Purple Rose of Cairo, one of the most famous dogs of all the Razors Edge Pitbulls. Razors Edge Kenna Claddaugh, Razors Edge Top Notch Chino, Razors Edge Chi Chi of Trueblue, Tonka and Jigga and Iced Mocha are also productions from this breeding. When the time was right the grand champion knuckles was bred to Paddington, which produced another female, named Viagra. Viagra was bred to the legend Cairo and produced one of my favorite males Razors Edge V’s Lil Ro, AKA “RO”. They also produced Cai, Diva, Caira and a few more. RO lives his own legacy today in producing some beautiful dogs such as Suarez Bulls Samurai Paco and genuine Edge’s Toxic, and Titan Kennels Titan, just to name a few males off of him. Cairo was also bred to a few other females, such as the Cairo and Koi Breeding. Koi who is out of GR CH Knuckles and Dakota (Paddingtons sister), was bred to Cairo and produced Rage, Neela, Brooklyn, Shamrock, Rolli, Rosetta, and Diamond. Cairo was also bred to tiki and produced a male by the name of Hennessy. The Cairo side of razors edge pitbulls is just a fraction of the bloodline. The line has been taking in different directions but everything basically stems from the knuckles, paddington, and rage blood. Another well known producing dog is Razors Edge CLP’s Short Shot, Short Shot is off of Buckshot and Rage. Shortshot has done a few breedings is his life, such as Diamond, and more recently Paradise and Steel. There are also sections of the blood that are almost like a line in its own depending on what your looking for. You’ve got the Cairo side, the Shortshot side, then you have the Manu side, Dozer Daisy line breedings, which all basically tie into each and every dog produced from razors edge pitbulls yard in the very beginning! You just have to connect them all together producing outstanding dogs from the start and putting time and effort and lots of money into building a dream. Razors Edge Pit bulls Kennel has been involved in learning, breeding, showing, training and raising the American Pit bull Terrier for well over 20 years and it keeps getting better! Razors Edge is a bloodline for everyone. It offers show quality dogs, correct bully dogs, and some overdone dogs (overdone meaning extreme bone, head, and chest) But at the same time very clean dogs compared to other lines. There are several Razors Edge top dogs that carry the head chest, bone and girth that personifies the American Bully. In my opinion, this is a cleaner dog than some of the other lines. Although it isn’t ashyped up as some of the newer Gottyline dogs that have stolen the spotlight recently, this is as good or better. It all depends on what you’re looking for. But if you’ve been sleeping on the Razors Edge Bloodline, you need to wake up. This bloodline has been producing heavy hitters for years. No hype, all substance. Real dog men know this.